This cake was a riot to plan, to make and to serve. It was made for a co-worker’s going away party. All the co-worker requested was lunch at Popeye’s. Well she got her Popeye’s and the nickname ‘Biscuit’ and a Chicken Leg cake. 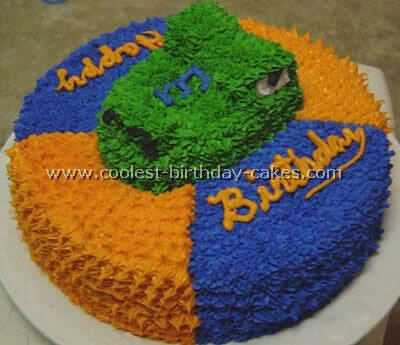 The cake was made using rounds made from any cake recipes and stacked and shaved into shaped. It helps if the cake is semi-frozen if using white icing on chocolate cake. 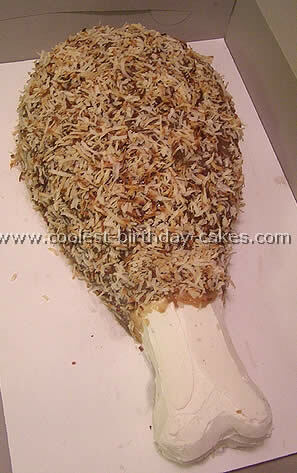 The bone of the ‘leg’ was created using store bought white icing. The ‘flesh’ was created using a thin coat of chocolate with German chocolate icing over it and a lot of toasted coconut since this was the secret ‘crispy’ recipe. 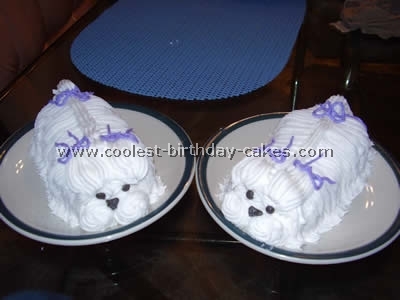 Thanks for all the wonderful creative birthday cake ideas on this site!